The Scientific Council of PLERCIM consists of four scholars - two from the University of Warsaw (Prof. Jerzy Tiuryn and Dr. Hung Son Nguyen) and two from the University of Wroclaw (Prof. Leszek Pacholski and Dr. Hab. Marek Piotrów). Both universities also have their representatives in ERCIM bodies: the Board of Directors (Prof. Jerzy Tiuryn), the Executive Committee (Dr. Hab. Marek Piotrów) and the Editorial Board of ERCIM News (Dr. Hung Son Nguyen). "ERCIM should give the scientific community of Polish mathematicians and informaticians a stimulus to foster engagement and international cooperation with leading research institutions of Europe in the corresponding areas of research", said Jerzy Tiuryn, president of PLERCIM. "This engagement is anticipated on several levels: access to high-quality post docs, involvement in the existing research working groups of ERCIM, a possibility of creating international working groups within ERCIM in the scientific areas of mathematics and informatics, which are strategic for the Polish research institutions, and easier involvement in international research teams in connection with the European Union's 7th Research Framework Programme. I believe that our joining of ERCIM will be mutually beneficial. I am looking forward to this cooperation." PLERCIM will host the 2007 ERCIM autumn meetings in Warsaw on 21-23 October. 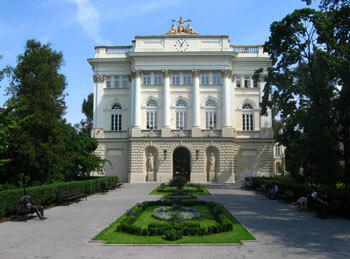 The University of Warsaw (Universitas Varsoviensis, est. 1817), is the largest university in Poland. It teaches over 56 000 undergraduate students and around 2100 PhD students in nineteen faculties. About 11 000 students graduate from the University every year. It offers a broad range of courses taught in Polish and English in 76 areas of study. There are around 850 professors and 2000 scientists involved in teaching and research. The Faculty of Mathematics, Informatics and Mechanics, with almost 170 faculty members and researchers, is engaged in a wide spectrum of research areas, ranging from pure mathematics and theoretical computer science, to applied mathematics and applied areas of informatics. The Faculty consists of three Institutes: Mathematics (with over ninety faculty members), Informatics (almost fifty faculty members), and Applied Mathematics and Mechanics (with over thirty faculty members). Almost eighty Ph.D. students are involved in various research areas under the supervision of faculty members and researchers. The Faculty has the top research category in the Polish government classification. Traditionally the Faculty has its strengths in selected areas of Mathematics and Informatics. In addition it is expanding the scope of its research by focusing on some truly multidisciplinary areas such as Financial Mathematics and Computational Biology. An independent Section of Economic, Financial and Insurance Mathematics consists of faculty members from two of the three Institutes: Mathematics, and Applied Mathematics and Mechanics. There are close to 1500 students at the Faculty attending a wide variety of courses. There are nearly 250 lectures offered each year at the undergraduate, master and doctoral levels. They cover numerous topics in computer science - both theoretically and practically oriented - and in pure, applied and financial mathematics. The Faculty also offers basic courses in mathematics and informatics for about 2000 undergraduate students at Economics, Management, Chemistry, Physics, Biology, Geography, Geology and Education Faculties. Theory and Applications of PDE's and Functional Analysis. The University of Wroclaw (Universitas Vratislaviensis, est. 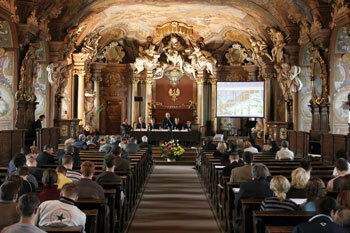 1702) is the largest university in the south-western part of Poland called Lower Silesia. It teaches over 40 000 undergraduate students and about 1300 PhD students in ten faculties. About 9000 students graduate from the University every year. The University offers a broad range of courses taught in Polish and English in over seventy areas of study. The Aula Leopoldina in the main building of the Wroclaw University. There are about 500 professors and 1300 scientists involved in teaching and research. The Faculty of Mathematics and Computer Science consists of two parts: the Mathematical Institute and the Institute of Computer Science. It teaches 870 undergraduate students in mathematics, 520 undergraduate students in computer science and 50 students in PhD programmes in both disciplines. The Faculty has the top research category in the Polish government classification. With about forty professors and eighty other scientists it bundles its research and teaching capacities in many areas crucial to the development of the information society. Currently, the Faculty is involved in six EU grants and nine grants from the Polish Ministry of Science. Programming Languages Group: theory of programming languages, theory of automata, symbolic computations, fundamentals of Internet security, software engineering and computer graphics. Computational Complexity and Algorithms Group: approximation algorithms, probabilistic algorithms, online algorithms, parallel, distributed and mobile computations, cryptology and computational complexity. Numerical Methods Group: computational statistics, continued fractions, finance data analysis, numerical integration, numerical methods of differential equations, optimization methods, computation with recurrence relations, special functions and orthogonal polynomials. Research in the Mathematical Institute is focused on: harmonic analysis, partial differential equations, differential and metric geometry, applied probability and statistics, foundations of mathematics, mathematical logic, model theory, measure theory, algebra and number theory.